A highlight of any holiday in Athens is a visit to the Acropolis. One of the earliest religious complexes in ancient Greece, this awe-inspiring heritage from its the Golden Age still dominates the skyline of modern Athens. The Acropolis is an extremely popular tourist attraction and each day bus loads of tourists of different nationalities descend upon the site. Shuffling in the queue as you wind your way to reach the top can be a test of patience as sometimes the less public spirited group tourists may jostle and push their way through causing others to lose their cool. If you’re able to get there early in the morning or in the late afternoon when there are less tour groups, you may have a more pleasant experience of this impressive site. The complex is open from 8am to 7pm in summer and from 8am to sunset in winter. To reach the plateau, you enter through a large portal, and at the top are the ruins of three of the most important temples built in the 5th century BC. The Acropolis is under various stages of restoration and photographers may be a little frustrated by the scaffoldings. 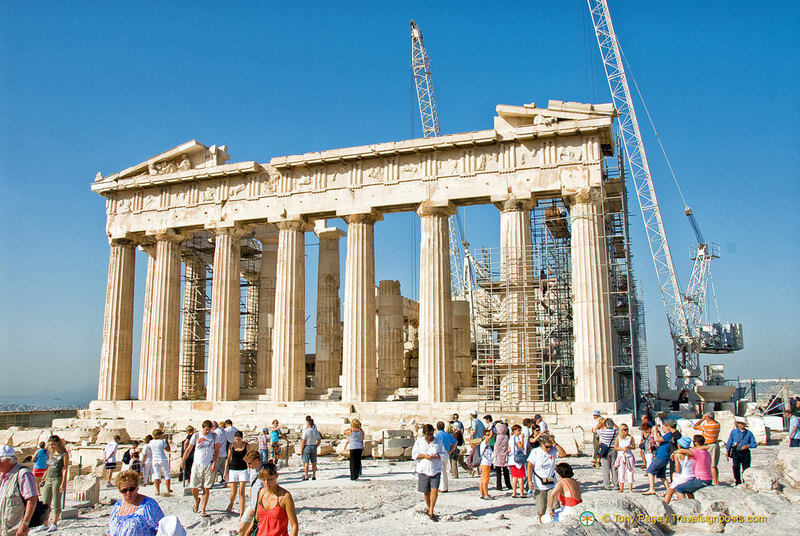 The Parthenon is the largest building on the Acropolis and one of the world’s most legendary man-made structures. It was built by Perikles to honor the virgin goddess Athena. Except for the wooden roof, the whole building was constructed entirely out of marble. The Parthenon’s architecture and illusion of perfect symmetry has been the study of many architects and historians and thousands of buildings around the world have been modeled on it. Most of the artifacts from the temple are housed in the Acropolis Museum nearby. The Temple of Athena Nike, also called the Temple of the Wingless Victory, is a small temple that once contained a sanctuary and an altar for animal sacrifices. The temple was restored to its former splendor in time for the 2004 Olympics. 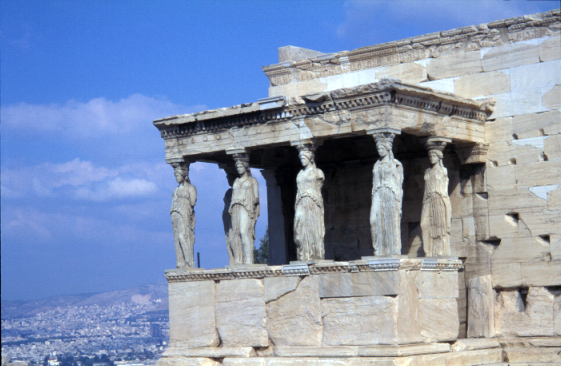 The Erechtheion , my favourite structure, can be recognized by the six maidens, or caryatids, holding up the roof of the porch. Five of the original caryatids are stored in the new Acropolis Museum with the sixth in the British Museum in London. The old Acropolis Museum hidden behind the Parthenon has been closed since 2007 and all its contents are now displayed in the impressive new Acropolis Museum nearby. It contains all of the portable objects removed from the Acropolis since 1834. It displays antiquities including three of the original sculptures from the Parthenon’s pediment and sculptures of humans and animals dating back to the 6th century BC. From the top of the Acropolis, you also get a sweeping view of Athens and the Saronic Gulf. Crowds and scaffolding notwithstanding, this ancient sacred site never fails to impress its visitors.